In my ongoing quest to become more Chinese, I’m picking up my Canto-learning again, one step at a time. That means listening to more Cantopop on KKBOX (reading lyrics really helps) and taking note of any interesting phrases I come across. 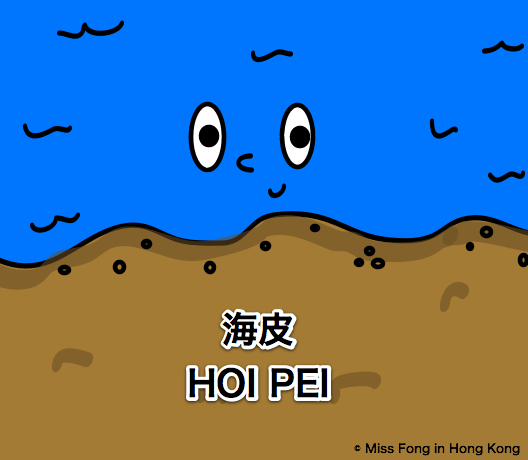 One of them is 海皮 — “hoi pei”, which means sea shore. I first heard it when taxi drivers would ask me if I wanted to go home via the highway or the “hoi pei”, and it’s never not sounded funny to me. In my head, I just can’t help visualizing it as literally the “ocean skin” since “海” means ocean and “皮” means skin. Am I crazy?? To be fair, “ocean skin” is a super accurate description of the sea shore as the “skin” can be anything from sandy and bumpy to smooth and layered. To use this word, simply tell your taxi driver, “NO highway, YES hoi-pei!” Other suggestions welcome! The pointy haired man exists!